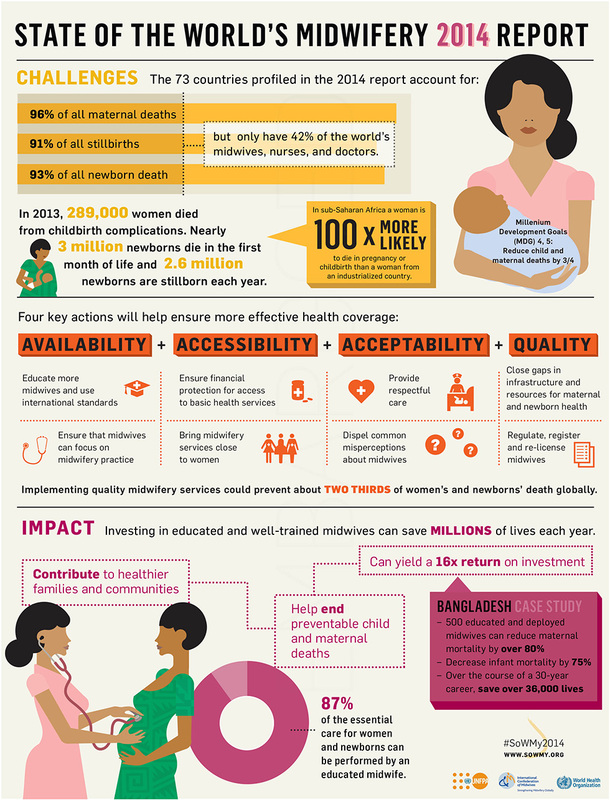 The State of the World’s Midwifery (SoWMy) 2014 presents findings on midwifery from 73 low and middle- income countries. The report, produced by UNFPA, the International Confederation of Midwives (ICM), the World Health Organization (WHO) and several other partners, shows the progress and trends that have taken place since the inaugural 2011 edition, and also identifies the barriers and challenges to future progress. The report focuses on the urgent need to improve the availability, accessibility, acceptability and quality of midwifery services. Despite a steady drop in maternal and newborn deaths since 1990, hundreds of thousands of women and newborns continue to die each year during pregnancy and childbirth: An estimated 289,000 women and about 3 million newborn babies died in 2013 alone. The vast majority lost their lives due to complications and illnesses that could have been prevented with proper antenatal care and the presence of a skilled midwife during delivery. UNFPA and WHO on behalf of the H4+ (UNAIDS, UNFPA, UNICEF, UN Women, WHO, and the World Bank) with the International Confederation of Midwives (ICM) and supports the UN Secretary-General’s Every Woman, Every Child campaign.